Participate and observe local celebrities compete against one another during this interactive game. Famous people from our community will complete strange and funny tasks in their race to the finish during this fun-filled evening. Afterward, play life-size games like Giant Jenga, Pickup Sticks, and Connect 4. Food, cash bar, and door prizes will be offered. Free parking is available in the Memorial Center for Learning and Innovation parking garage at Rutledge and Carpenter streets. Light refreshments will be served. The two-hour program begins at 6pm in room 2A on the MCLI's second floor on 228 W. Miller Street. To register, visit MemorialMedical.com/Events or call 217-757-7370. Springfield Jaycees Beerfest presented by Levi, Ray & Shoup, Inc. The Springfield Jaycees are back again this year with Beerfest presented by Levi, Ray & Shoup, Inc. This annual event is beginning to pick up steam with local breweries (and wineries) serving up samples of their favorite brews for charity. Tickets available online. Make sure to reserve your Beer Enthusiast ticket early as these are limited to 100 tickets and get you in one hour early to ensure you have access to your favorite beers! This year's glass sponsor is Ben Sgro, Attorney at Law. 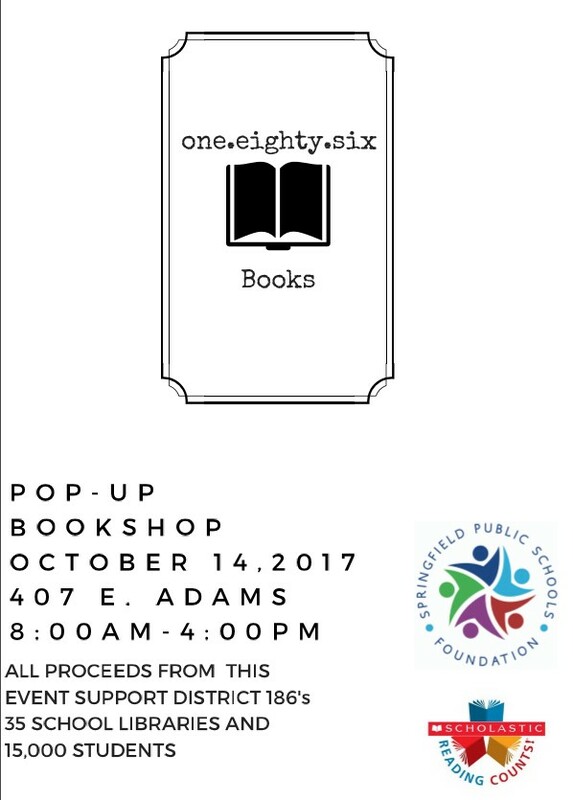 The Springfield Public Schools Foundation is hosting its first-ever One.Eighty.Six Pop-Up Book Shop, conveniently located in Downtown Springfield in the heart of the Old Capitol Farmers Market, on Saturday, October 14, from 8 AM to 4 PM. There will be a wide variety of books available for purchase for both children and adults. Proceeds from the event will be used to supply books for school libraries district-wide. The Candlelight Walk offers the only opportunity to see the village at night. Period clothed interpreters will be inside many of the log homes and shops in the village to talk about life in 19th century Illinois. Gingerbread and cider will be served in the Rutledge Tavern. ONE NIGHT ONLY- THURSDAY OCTOBER 5th - 8 PM ONLY! Help Sojourn end the cycle of domestic violence. October is domestic violence awareness month. They are kicking off the month by holding a Comedy Charity Event for Sojourn featuring Tim Meadows at Donnie B’s Comedy Club. Don't miss this Saturday Night Live comedian! Join us Friday for pre-game Happy Hour specials as we kick off our weekend homegames. 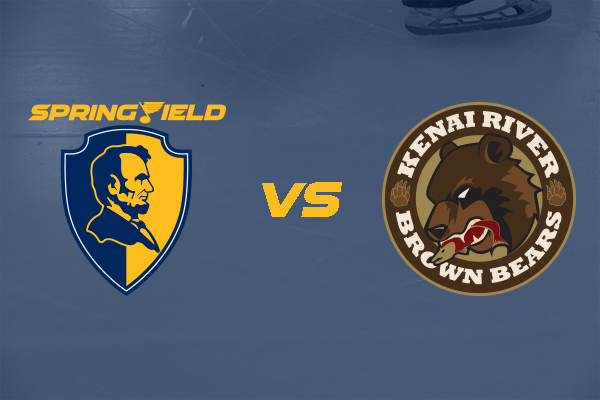 Then come back Saturday for our Kids Club Game and stay after the action for our post-game skate! Kids Club members get into this game for FREE, so bring your badge and cheer on the boys! Come watch a fall themed movie with us under the lights and stars on a large, inflatable movie screen. Movie starts at dusk (around 6pm). This is a double feature. No outside food/drink allowed. Popcorn, soda, nachos and candy available for purchase along with chili, hot cocoa, and more from the food truck. Children under 16 must be accompanied by an adult. $5/child & $8/adult. Please note there will be no seating, so a blanket or chairs are suggested. Oktoberfest at Engrained is shaping up to be the biggest and best yet! A portion of all proceeds will be donated to Generation Healthy Kids. 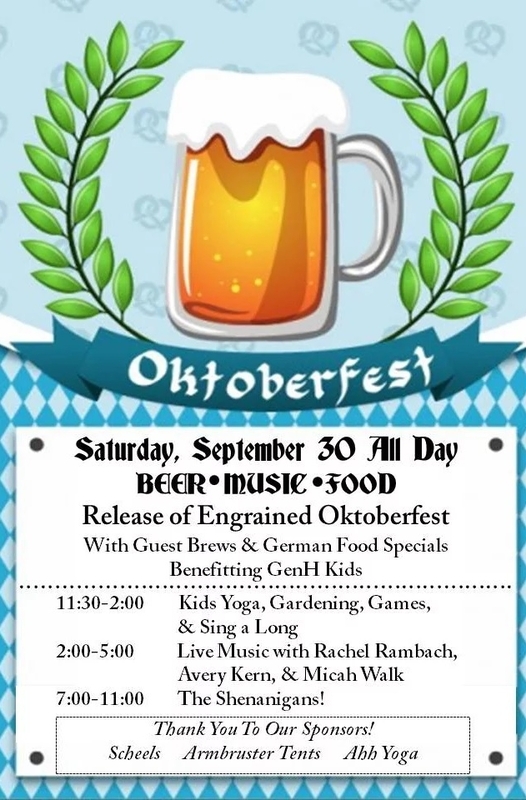 Along with the release of our own Engrained Oktoberfest, we'll have family activities during the day sponsored by Scheels, live music all afternoon, and The Shenanigans playing all night! Join our event for more to come on the schedule and ticket details. Join AlignLife for the 3rd annual Run for Prevention at beautiful Washington Park. Commemorative race shirts for registrants AND every participant who completes the race will get finisher medals as well! You can even bring a team and "Rep Your Team" by getting creative with outfits, shirts and more. Each age bracket will have 1, 2 and 3 place medals and there will be trophies for the top overall mens and womens times! Vendors will be on site after the race for amazing interactive booths, music, games and so much more! New patch attractions include Paintball Shootout and Riddle Hill Rock Mine. At paintball shootout, test your aim by shooting at metal pumpkin targets, while the rock mine offers a hands-on, discovery adventure as you pan for gems, rocks, arrowheads, and seashells. There will also be several hidden bags with real cut rubies, sapphire, amethyst, and even a diamond! Returning this year are popular attractions including the foam pit, corn and bean mazes, wagon rides. Also, don't forget to shoot a pumpkin from the patriotic pumpkin cannon. No wristband or entry fee required to pick out pumpkins, see live music (when available), check out the barn and all of it's goodies, or enjoy a free bag of popcorn and cup of apple cider. Wristband required for activities only. This year the patch is offering convenient pricing packages. Prices also available on the Bomke's Patch website. See photos, news, and updates on Facebook.